Specifically developed for multi-hole precision drilling in steels such as carbon steels, alloy steels and hardened steels (303SS, 304SS, 316SS, 403SS, 404SS, 410SS, 420SS,430SS, etc.). Wide chip pocket enables smooth chip evacuation under high speed and feed drilling conditions. 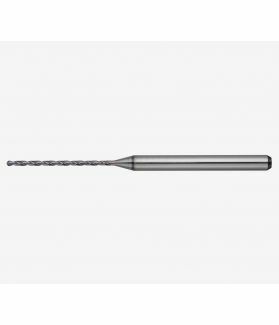 The Fine Coating System (FCS) especially developed for micro precision drills keeps edges sharp, allowing excellent cutting performance and wear resistance. Slight honing on drills over φ 1.6mm(=0.06299”) prolong tool life while preventing chipping in high speed and high feed drilling conditions.